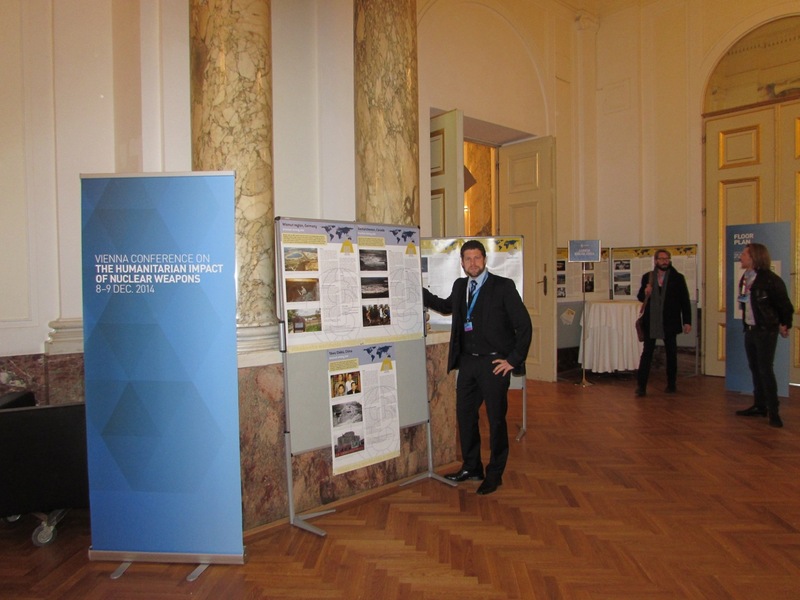 Alex Rosen with IPPNW’s Hibakusha Worldwide exhibition, which stands outside the conference hall. 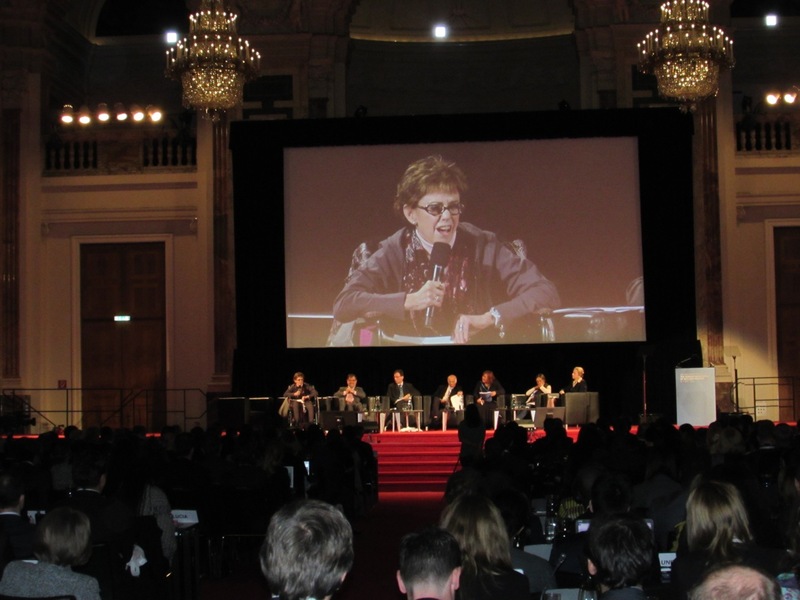 The Vienna Conference on the Humanitarian Impact of Nuclear Weapons opened yesterday with more than 160 States in attendance (we’re still waiting for confirmation of the exact number), and with far more than 300 representatives of international organizations, civil society, and academia crowded into a beautiful ballroom in the Hofburg Palace. Our Austrian hosts, UN Secretary-General Ban Ki-moon, and Pope Francis minced few words in asserting that the factual evidence about the overwhelmingly destructive nature of nuclear weapons has to provide the framework for their elimination, and that not nearly enough is being done to implement the nuclear disarmament obligations established by the NPT and international law. Ban Ki-moon, in a statement read by UN High Representative for Disarmament Angela Kane, criticized all the rationales the nuclear-armed States give for continued possession, said that deterrence policies add to instability in the world, and condemned the modernization programs in which all the nuclear-armed States are currently engaged. The Pope also came down hard on deterrence and said that the “future of the human family” depends upon banning nuclear weapons once and for all. The Austrian foreign minister, Sebastian Kurz, traced the origins of the three HINW conferences back to the 2010 NPT Review, which had expressed deep concern over the humanitarian consequences of nuclear weapons in its outcome document, and explained his intent to bring the evidence and conclusions of Oslo, Nayarit, and Vienna back to the 2015 Review. I won’t say much here about the content of the program on the first day, which largely expanded upon and reinforced the evidence of medical, environmental, and humanitarian damage done by nuclear weapons. Despite some suggestions that some national and international agencies could prepare a little better for radiological disasters and events short of nuclear detonations themselves, the conclusion that an international medical and emergency response to the use of nuclear weapons would be impossible to organize or to implement was reaffirmed. IPPNW didn’t make formal presentations in Vienna, as we did in Oslo and Nayarit, but our work was referenced repeatedly by those who did speak, including Mary Olson of the Nuclear Information Resource Service, who made a presentation on the medical consequences of nuclear war and exposure to radiation, and climate scientist Michael Mills, who brought participants up to date on the research into global climate effects of nuclear wars on various scales. I think it’s safe to say that this new understanding of the climate effects of a limited, regional nuclear war, along with IPPNW’s assessment that at least two billion people would be at risk of starvation, has registered and is now being cited regularly in these discussions. So much so, that when the Indian delegation took the floor during a question and comment period later in the day, the speaker made a now familiar complaint that it’s unfair to single out India and Pakistan, as though their nuclear weapons are somehow worse than those possessed by others. The fact that nuclear weapons are all equally abhorrent doesn’t exempt India and Pakistan from being used as examples in a scientific study that requires actual data, aside from which, the regional example was immediately followed by a review of the far more devastating nuclear winter that would result from a US-Russia nuclear war. So maybe it’s just the exhaustion talking, but the Indian complaints sound a little petulant. The gold medal for petulance, however, goes to the US, for almost immediately announcing its intentions to act as a spoiler during this conference, and showing utter disrespect to a session chair in the process. US downwinder Michelle Thomas of Utah vividly recalled the atmospheric nuclear tests that destroyed her health and the health of her entire community. What happened was this: after a series of very painful and emotional testimonials from three victims of nuclear testing in the Marshall Islands, Australia, and the US, the floor was opened for interventions from the State delegations and civil society. The chair requested explicitly that speakers limit themselves to brief questions and comments, and reminded everyone that the time to deliver statements would be during the general debate on the second day. The US speaker took the mike and said he did not have a question and, in fact, did have a statement. He then launched into the usual US litany about the arduous step-by-step work that had to be done to achieve a world without nuclear weapons someday off in the future; said the humanitarian impact of nuclear weapons was already well understood; and said the US rejected any proposals for a nuclear weapons convention or a ban. So much for constructive engagement. The long-anticipated general discussion about how to use this humanitarian framework as a basis for faster and more decisive action on nuclear disarmament comes this afternoon. ICAN campaigners are working the floors hard to ensure that as many States as possible support our call for a ban treaty process. What an exciting conference – thanks, John, I felt like I was there. Congratulations to all who worked so endlessly to bring forward the abolition of nuclear weapons.